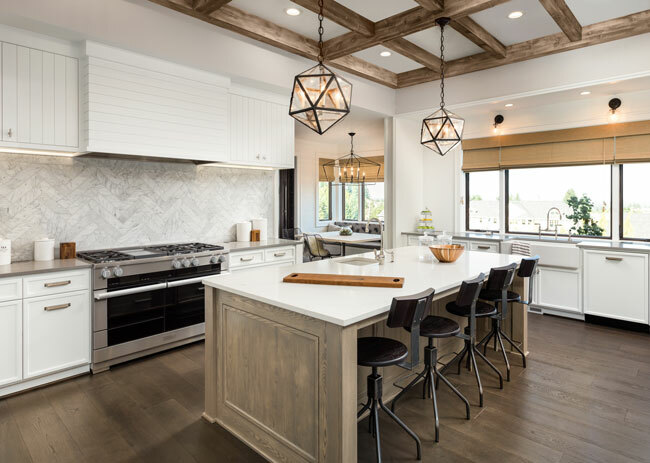 Whether you just purchased a home or are remodeling your existing living space, lighting is a major factor in the functionality as well as the aesthetics of each room. Your bedroom, bathroom, kitchen, and basement all have different dimensions, serve various purposes and can be illuminated in multiple ways. When deciding between surface-mounted fixtures or recessed lighting, first consider the height of the ceiling! While a chandelier in the basement may look elegant, it’s certainly not practical for most homes. Cost is another crucial factor. What’s your budget? Even with LED lights as the new norm, the more lights you need, the greater the upfront cost. The size of the room is yet another variable to consider. Recessed lighting in the basement may look amazing, but you might need to install up to four recessed lights to adequately brighten a 100-square-foot area. Installing 10-20 recessed lights is more difficult, time-consuming, and expensive than installing mounted fixtures, but could be worth it in the end (depending on the look you’re trying to achieve). This brings us to aesthetics. Beauty is in the eye of the beholder, as the saying goes. Recessed lighting can make a room appear larger, can highlight shelves, bookcases or other items you’d like to put on display, and has a clean, modern look and feel (and dimmable recessed lighting can help set the mood). Surface-mounted fixtures come in an endless array of shapes, sizes, finishes and colors, and can act as a focal point of the room. There are pros and cons for both surface-mounted and recessed lighting. In the end, it really all comes down to what you prefer. Our expert electricians can advise on what would work best in your home and can easily (and safely) install your new equipment, regardless of the type of lighting you choose. Give us a call and let’s make your dream a reality today!